Many tin-roofed jerk-pit shanties dot the road around Boston Bay, selling mouth-watering jerk pork, chicken and fish. Some discriminating folks say the best jerk comes from Boston Bay. We suggest you try Jamaican Country Style's Boston Bay Jerk Sauce. You be the judge. Imported from Jamaica. Busha Browne's Spicy Jerk Sauce is a product of Jamaica and Busha Browne has created a wonderful jerk marinade with a uniquely Jamaican flavor. Spread the jerk sauce on pork, steak, chicken, or fish prior to grilling. Or add some to soups, dips, or marinades, it is equally delicious. 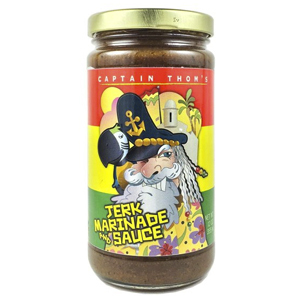 Captain Thom's Jerk Marinade And Sauce is a traditional Jamaican style marinade. It is hot and spicy, made with Scotch Bonnet Peppers. Goes great on Pork or Chicken- jerk them both! The Shizzle is a unique Jamaican jerk-style marinade that comes in Voodoo Hot and the Original Flavor. It is an honest product from an honest place, Jamaica. It was born out of passion for good food and good times, drenched with good beer. These jerk marinades are made KINDLY in small batches and truly are unique in flavor and outstanding when cooked on traditional jerk chicken. Try them on fish, pork or anything you can smoke. Walkerswood Mild Jamaican Jerk Seasoning, 10 Oz. Walkerswood Mild Jerk Seasoning has tempered the Scotch Bonnet peppers in our Traditional HOT & SPICY Jerk formula to allow for a gentle spicy kiss while maintaining the true Jamaican Jerk Seasoning taste. This is just like the Original with a little bit of the heat taking off the top! UNREAL!!!! Imported from St. Ann, Jamaica, authentic Walkerswood Traditional Jamaican Jerk Seasoning is extremely hot and very potent. A little of this jerk seasoning goes a long way. Easy recipes are on the bottle for everything, from chicken and pork to vegetables and soups. Mix it with a little reggae.